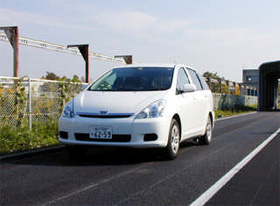 The tire and road surface noise measuring vehicle measures the tire and road surface noise at a fixed speed (50km/h). By measuring the tire and road surface noise, it will be possible to carry out performance evaluation of the noise reduction effect of porous asphalt paving and the noise values before and after repairs are carried out. 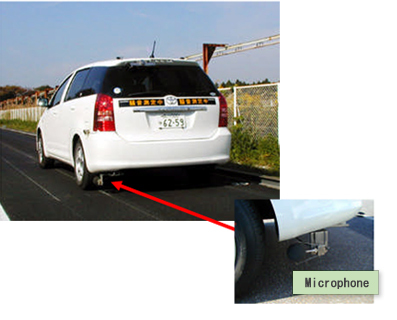 The external temperature and vehicle speed information required for noise value correction is simultaneously acquired. The road surface temperature (tire temperature) can also be simultaneously acquired. Adjustment of the driver’s speed (to 50km/h) is supported (display of speed error using sound and lights). By linking with a noise analyzing system, the time for analyzing can be shortened. Measured position is confirmed using the position detection sensor. The measured data can be shown in real time on the monitor of the car navigation system.